It is often a good idea to consider buying a piano stool to go with your piano as other seat are often not quite the right height. 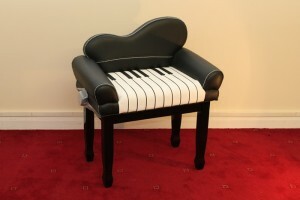 Piano stools generally come in two main types either fixed height or adjustable. These stools normally have as fabric top that lifts to reveal a box for music underneath, they come in a variety of leg styles and also have a deep box version for those that require more music storage. There are a range of fabric top materials and colours and a wide choice of wood finishes to complement most piano shades. These stools can be height altered to ensure that the player is seated at exactly the correct position for comfortable playing. Most of these stools don’t have any music storage due to the adjustable mechanism but there are a couple that do offer a small music compartment. 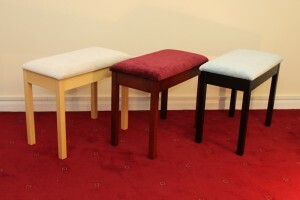 Again these stools will also come with a wide range of top colours and wood finishes. If you are looking for a better quality stool, we can supply a range of British built stools in either a fixed height or adjustable style. These stools are all made to order and are built to last with fully jointed corners rather than the bolt on legs of the budget ranges. These come in a range of finishes with different coloured tops. All materials used comply with current British Fire Safety Standards. Most of the stools we supply come from our mid range which are an affordable robust option with a good choice of fabrics and wood finishes. 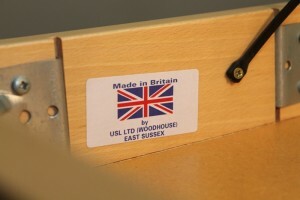 They are generally of British manufacture with just a couple of Italian and Chinese imported models. 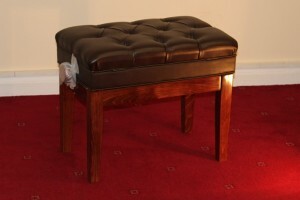 These stools are again in solid wood but have a ‘bolt-on’ leg so can be supplied flat-packed. All materials used comply with current British Fire Safety Standards. We tend not to stock cheaper stools as we find the quality quite inferior and the lifespan of them tends to be very short. We have also experienced problems obtaining the proof that the materials used are to the correct safety standards. Many of the problems that pianos develop are due to temperature and humidity changes within the home. If humidity levels rise, felt bushings within the keys and action will often absorb this moisture which can lead to sticking keys or a ‘sluggish’ feeling to the action. On many occasions all that is required is a small heater to be installed inside the bottom of the piano. These heaters are mounted in the bottom of upright pianos and should be left on constantly to keep the air inside the piano dry thus preventing the problems mentioned above such as sticking keys. These heaters have a very low wattage, normally around 25W, and are therefore cheap to run but they are often very effective. If you find that you need a more comprehensive humidity solution then we can supply and fit the Dampp-Chaser humidity system which keeps the temperature and humidity levels strictly controlled in and around the piano therefore ensuring that it maintains its tuning stability and action responsiveness despite the climatic changes inside and out. If you have ever fancied repairing your own piano we are happy to give you some practical advice and can also supply you with the various piano parts that you might require, from sets of tie-tapes and various felts to springs, tuning pins, keytops, and piano wire. We keep a wide range of parts in stock in our workshops and can help with hints and tips on fitting these parts.